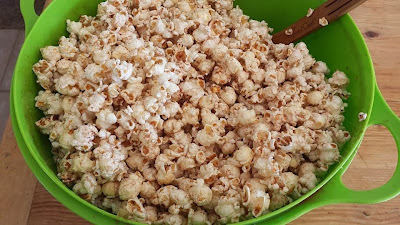 Honeyed Cinnamon Pop Corn, picture Saturday morning, you aren't going anywhere your kids have declared it a "Jammie Day" and cartoons after minimal chores have been flipped on. "Can we have Pop Corn for breakfast?" On a "Big breakfast morning, which normally include an hour in the kitchen of cooking and an hour of clean up, this sounds like and exceptional idea. "Can it have caramel in it?" 3 of 9 of my kids have been diagnosed with ADHD and a colorful Alphabet of other fun combinations. Sugar is used sparingly in our home, mostly because I am a fan of my kids not turning into Tasmanian Devils, and I don't own a taser gun. If you like Caramel Corn, or Kettle Corn...this is for YOU! In another microwavable container or in a pot on the stove combine and melt 1/3 to 1/2 cup of coconut oil and 1/3-1/2 cup honey, in equal parts. Slowly pour melted mixture over popcorn tossing it. to taste sprinkle cinnamon and mix in. I personally need a lil' salt in my sweet. CAREFUL not too much, but a little seasalt tossed in bumps this up to addictive , snack crack. Such a great healthy alternative sweet treat to other sugary tantrum and sugar crashing sweets. I of course DOUBLE, TRIPLE and FREEZE! Place all ingredients except CORNSTARCH & WATER, in a large saucepan. Cover and bring to a boil. Turn down to a simmer and cook 1 hour (while your meal is cooking). Strain broth and remove bay leaves. Place all the rest of veggies and herbs in a food processor and add enough broth to puree to a smooth consistency. Pour both broth and puree back into pan, using a wooden spoon to deglaze the sides of the pan, this will brown your gravy and add to the rich flavor. In a cup make a SLURRY by mixing cornstarch with water and stir till fully dissolved. Add slurry to boiling broth and stir with a whisk to prevent lumps. Serve hot. Lightly butter each side of Udi's Gluten Free Whole Grain & White Sandwich breads. Broil Udi's Gluten Free Whole Grain & White Sandwich Bread till slightly brown/toasted. Allow bread to cool completely on a wire rack. (we just let a kiddo feel uber helpful and toast the bread two by two. Put bread in a Ziploc bag and slightly break toasted bread into bread crumbs (or cut into pieces). Place in bowl with parsley, sage, salt and pepper. Melt butter in a 12-inch heavy skillet over medium heat; add onions and Garlic and saute until onions are softened. Add fennel and celery, stirring occasionally until vegetables are soft. Transfer vegetables to bowl with the toasted Udi’s gluten free bread crumbs. Add eggs, stock, and gently toss. Transfer mixture to a buttered shallow baking dish. Bake, covered, in middle of oven for 30 minutes at 325 degrees. 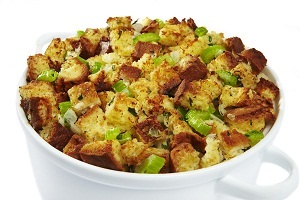 To brown the stuffing, uncover and bake for an additional 20 minutes. Simple GLUTEN FREE Shortbread Cookie Crust. 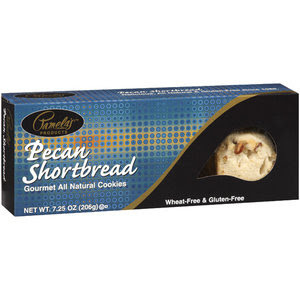 1 package of Any Good Gluten free Shortbread Cookies. Finely crush cookies in a medium bowl. Lightly coat a 9-inch pie pan with butter or non-stick cooking spray. Firmly press cookie crumbs on the pan completely covering the pan; bake in an oven for 350 degrees for 6-19 minutes, or until slightly brown; cool until ready to be used. Can be frozen. Pour in desired pie filling. Drain the artichoke hearts, but reserve the liquid. Roughly chop the artichokes, and then add all ingredients to a large pot over medium low heat. Stir ingredients frequently as they warm to prevent burning. Artichoke liquid may be added as needed to thin out the dip. Once the dip is heated through and the cheese has melted, pour the dip into a preheated slow cooker for serving. Mix first three ingredients and press in bottom of a 9"x13" pan. Bake at 350 degrees (metal pan) or 325 degrees (glass pan) 8 minutes. Let cool completely. Beat 1 cup sugar and cream cheese. Fold in Cool Whip. Spread over pretzels. Mix Jello and water until dissolved. Add berries. 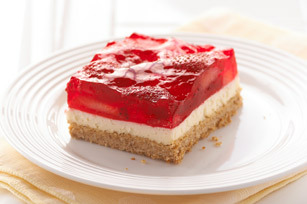 Stir into Jello, then set aside for 10 minutes. Pour over cheese mixture. Chill.